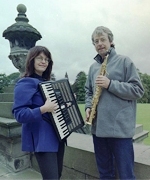 From Pennan to Penang was written by Richard Ingham in 2003-2004, and is a series of musical responses to travels made in 2002, in Scotland, Ireland, England, France and Malaysia. The work is written for soprano saxophone and accordion — two reed instruments with of course radically different playing methods. There are eleven movements in the suite. Richard Ingham is Visiting Professor of Music at the University of St Andrews. 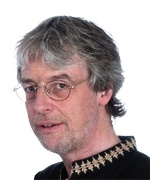 He is a composer, international saxophone soloist and renowned jazz educator, has appeared by invitation at every World Saxophone Congress since 1985, and is editor of the critically acclaimed Cambridge Companion to the Saxophone. He has written many works for the saxophone, including From the Mountains to the Sea for saxophone choir, Double Concerto for saxophone, accordion and strings, the suite for soprano saxophone and accordion From Pennan to Penang and Through a Landscape for saxophone quartet. His solo saxophone compositions include Distant Song and His Inevitable Lament. His most recent work is Taj Mahal, written for the National Saxophone Choir of Great Britain, of which he is Principal Guest Conductor. His Peter and the RTO, for narrator and orchestra, was written in collaboration with Alexander McCall Smith; Drift o' Rain on Moorland Stane is for chamber ensemble featuring the poems of Marion Angus, and a forthcoming work Robinson is for reader and jazz ensemble, based on the narrative poem by Brian Johnstone. Mary McCarthy studied with Dr Suzuki in Japan. She teaches in Edinburgh and internationally. 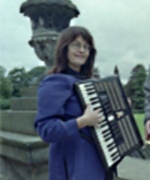 Mary works with folklorists in Scotland, Ireland and Serbia, and is tutor in Scottish Music at the RSAMD in Glasgow. She maintains close links with some of Scotland's leading composers and continues to develop her Serbian repertoire with composers and musicians there. She has recently given recitals in Ireland, the Caribbean, Europe, Sri Lanka and South America. Her solo piano album Molaidh Uist — In Praise of Uist has just been released. Mary was All-Ireland Champion accordionist and made many television and radio broadcasts in her teens. She currently leads the pioneering Suzuki teacher training course for pianists in Galway, Ireland.